First, we speak with filmmaker Annabel Park about the Citizens United ruling, made one year ago, that weakened restrictions on corporate political funding in the United States. Then, we discuss the ongoing controversy over the plan to tear down the Read’s drugstore building as part of the “Superblock” development project on the westside of downtown Baltimore. 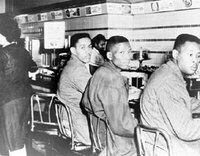 Read’s was the site of a historic sit-in 56 years ago today. Our guests are Dr. Helena Hicks, who participated in the sit-in and is now a member of the Baltimore City Commission for Historical and Architectural Preservation, Eli Pousson, Field Officer at Baltimore Heritage, and Bailey Pope, Vice President of Design & Construction at The Dawson Company, one of the developers working on the Superblock. The MOA was negotiated in good faith and the building in question is full of mold and un-savable from a construction standpoint. What standing does Preservation MD have to challenge what has aleady been negotiated? At what point does the greater community need to revitalize whole blocks outweigh the significance of a particular building?